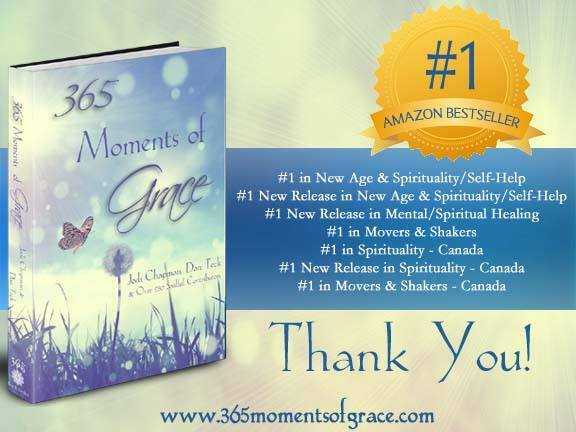 365 Moments of GRACE was released on June 21, 2016. Jodi Chapman & Dan Teck.Jerri’s Featured Piece is called, “The Limits of Heroism”. It is a story about the last time Jerri donated platelets for her sister, Rose. Gretchen’s Featured Piece is called, “A Mother Named Grace”. It is a story about Gretchen’s perfect role model, her mother Grace. What is grace?Grace is one of those concepts that is beautifully abstract, not easily definable, and heavenly based. It’s one of those words that asks you to sit with it for a little while – to take it into your heart fully and allow it to flow through each part of you so that you can fully comprehend it – and even then, it holds such mystery. To us, grace is synonymous with miracles. It’s evidence of our connection to our soul and to this magical world that we live in. It’s both the intangible feelings that we feel when we know that we aren’t ever really alone mixed with the tangible signs that we experience every single day. We define grace as presents from the universe that let us know how loved we are, how loving our world is, and how connected we are to all that is. It’s a word that’s filled with light and love. This book will contain personal stories of grace, miracles, and transformations from beautiful souls all around the world to show how magical our world is and how connected we truly are. It’s our hope that when someone picks up this book, they can flip to any page and find an inspirational moment that will help them to instantly plug into the universe and also to their soul.